The story has become a kind of TPL legend—how the community of Billerica, north of Boston, saved its last farm. At the heart of that story was Gil Griggs, shown here in 1994—the year the Billerica Town Meeting voted to assume a million-dollar debt to preserve a portion of his farm. Established in 1943, Griggs Farm was the place to go in Billerica for spring tomato plants or fall pumpkins. But by the 1990s the farm had been hemmed in by retail malls as the town’s character grew more suburban. When a big-box retail chain announced plans to build on 33 acres Griggs had been renting for farming, he solicited TPL’s help and rallied community support to protect the land. At the town meeting one speaker after another lined up to support the land’s conservation as a way of preserving farming and open space and controlling sprawl. 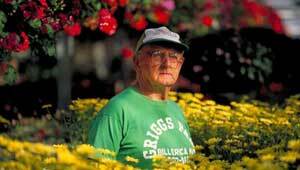 Griggs died in April 2006, at 88, having worked on the farm well into his eighties. Now run by Griggs’s son, William, the farm is one important legacy Griggs left to Billerica. Another was the understanding that neighbors, working together, can shape the future of their communities.